What does a halo engagement ring mean to your loved one? Just like the gemstone at the center of this setting, the person receiving this ring is the center of your attention. 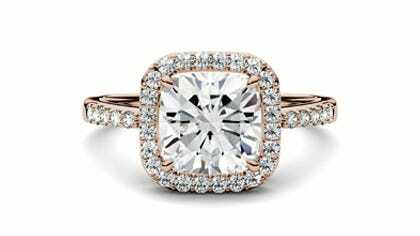 The surrounding stones accentuate the flash and beauty of the main moissanite stone and with endless possibilities of designs and ring styles, you can truly make this engagement ring your own. You can be bold with a double halo engagement ring or stick with the classic cushion cut halo engagement ring.